Why do you want your baby baptized? Most likely, it is because Jesus commands us to be baptized. "Unless you be born of water and the spirit, you will not have eternal life....." John 3:5. Baptism is a sacrament that deals with eternal life, with loving not just the body of your baby, but also the immortal soul! With the sacrament of baptism comes a way of life, a creed by which to live. It makes no sense to have a child baptized if we have no intention of teaching the child the ways of Jesus and of His Church. If we never or rarely attend Mass, if we are rarely present to the Church, then we are turning this sacrament into "magic" and "superstition." The Church is very clear in its teaching: Baptism is not an isolated event or a one time ceremony! These are the sacred promises that you will make to Almighty God during the rite of Baptism, for which you will have to answer to God at the end of your life. Ponder these promises. Begin now to prepare your heart to make them -- and to live them. Do not promise to God something that you have no intention of carrying out. You have asked your child to be baptized. In doing so you are accepting the responsibility of training him/her in the practice of the faith. It will be your duty to bring him/her up to keep God's commandments as Christ taught us by loving God and our neighbor. Do you clearly understand what you are undertaking? Later in the ceremony the priest will again direct his attention to the parents. Baptism is not just about a little baby, it is also about the faith of the parents. faith..... If your faith makes you ready to accept this responsibility, renew now the vows of your own baptism. Reject sin. Profess your faith in Christ Jesus. This is the faith of the Church. This is the faith in which this child is about to be baptized. The single question addressed directly to godparents during the baptismal ceremony underlines their role: "Are you ready to help these parents in their duty as Christian mothers and fathers?" 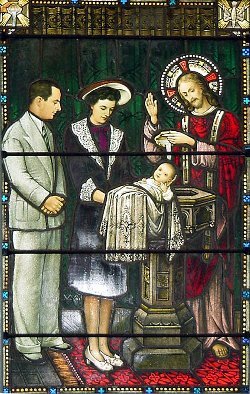 Godparents are called to represent what ought to be the concern of the whole Church-- that the child to be baptized is brought up in the ways of the faith. One of the godparents must be a fully initiated (confirmed) Catholic. If the other godparent is not confirmed, he or she is called a Christian witness, listed in this manner on the baptismal certificate. Godparents should live the Catholic faith in a visible fashion by faithful Sunday Mass attendance, regular use of the sacrament of confession, etc. If married, the godparent is to be in a valid sacramental marriage blessed by a priest. Since godparents are envisioned by the rite as helping the parents fulfill their duty in nourishing the spiritual growth of the child, it is inappropriate to have a child undertake this role. At least one godparent should be present for the celebration, with another person "standing in" for any godparent who is absent. At a future date, when the child celebrates the rite of Confirmation, he/she is encouraged to retain one of the baptismal sponsors as a confirmation sponsor, especially if that person has played a significant role in the child's growth in faith. Feel free to take pictures at any time during the ceremony, keeping in mind the importance of not disturbing the prayer of the congregation. For this reason, we ask that only one photographer per family be allowed to walk about. The child is clothed in a white garment (bib) during the ceremony. This garment is provided by the Church and is given to the child. A special candle is also used in the ceremony and given to the family. There is no fee for a baptism. If you would like to make a donation to the Church, you may do so. The way we can be sure of our knowledge of Christ is to keep his commandments. The man who claims, "I have known him," without keeping his commandments, is a liar; in such a one there is no truth. But whoever keeps his word, truly has the love of God been made perfect in him. The way we can be sure we are in union with him is for the man who claims to abide in him to conduct himself just as he did. If we say we love Jesus, but do not keep his commandments, we are liars. That's strong, isn't it? And yet it is the revealed Word of God. The third commandment comes to mind: Remember to keep holy the Sabbath day. Why is this so important? Because weekly Mass attendance prepares the immortal soul for its personal encounter with God. And isn't this what baptism is all about -- loving not only the body of your child, but also the immortal soul! Begin by choosing a Christian name for your child. Then teach him/her about his/her patron saint. Celebrate the saint's feast day with your child -- their "name day." Encourage family prayer at a young age. The blessing before meals, prayers at bedtime, The Our Father, Hail Mary, Glory Be, and a simple Act of Contrition should be part of every Catholic's home education. The rosary is a wonderful prayer with children because they learn by repeating. They also feel important if they have their own rosary beads. like Baptism, First Communion, First Penance, and Confirmation. Make a big deal out of these days. They have special meaning for children. Use sacramentals in your home. Display a crucifix prominently, a picture or statue of the Blessed Mother, a crib scene at Christmas. Emphasize penance and fasting during Lent. Use blessed candles and holy water in your home. Have your home/car blessed. These sacramentals are a way of absorbing Catholic values and practices and retaining a sense of the sacred all around us. Advent or Lent or the Easter Season. It's tough, but that's what our children will remember. The old adage is true: The family that prays together, stays together! -- from the Church bulletin to the Bible. The literature rack in the back of Church or at the rectory has a selection of good reading material for all age groups. If you never read Catholic literature, or speak positively about your Church, your faith, and your priests, your children will absorb negative values. Count on it!